We love hiking the Tuscan “anelli” (rings). We typically drive to a trail head, hike the route and return to our starting point. Each anello is unique. The one to Nipozzano Castle was exceptional! If you like castles, wine, beautiful Tuscan scenery, we suggest you visit the site called Sentieri di Toscana (Tuscan Trails). The Nipozzano is nothing short of magic. It is a hilltop hike which took us about 4 hours, including miscues, intentional wandering and many photo stops along the way. Have a look at the photo gallery we’ve included and the details to get you into a hiking frame of mind. On a slightly overcast mid-November day, we set out in search of the castle. Summer would surely have found the small town buzzing with activity, but we prefer feeling like we’re the only ones to ever discover a place, so an off-season, unplanned visit is perfect for us. However, with a little planning during the high-season, you will likely find a few tours available, and possibly discover a wine tasting reward at the end of your trek. Nipozzano is home to the famous Frescobaldi brand, one of the ancient Italian names synonymous with fine wine. The vineyards completely surround the castle. Here’s some background about the castle-town Nipozzano. The castle dates back to the year 1000, and is nestled in the heart of Tuscany just a bit north-east of Florence. Situated on a picturesque hilltop in the Appenine mountain range, it was originally built as a fortress for the protection of Florence, which is tucked into the Arno River valley below. Local lore has it that in centuries past, the word nipozzano, meant “without well.” Since the entire region can be somewhat arid and rocky, you can imagine how the location is considered perfect for vineyards. Early records indicate that during the Renaissance, famous artists/sculptors such as Donatello would visit the castle to buy wine. This was also the “neighborhood” where author/poet Dante Alighieri wandered the romantic hillsides in the 1300s. 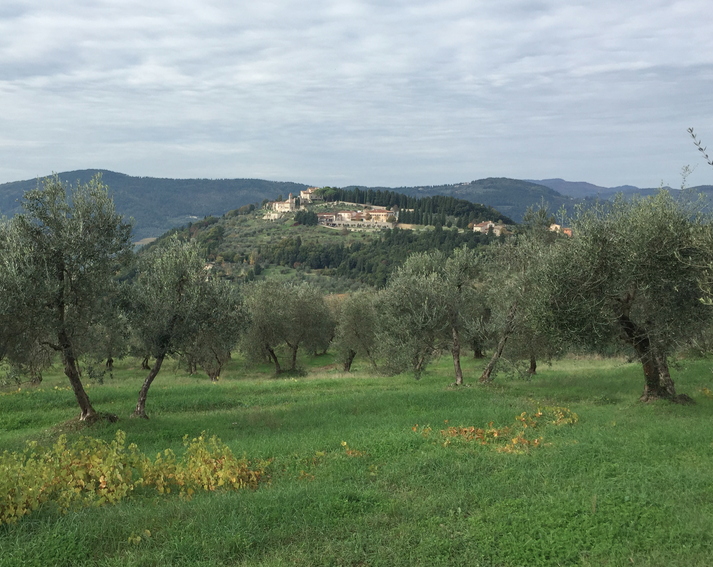 He surely would have been familiar with the famous castle, vineyards and olive groves. The hike begins and ends in the small town of Albereta just outside the larger river-town of Pontassieve, which is situated east of Florence. A description of the trail and a Google-earth map are the only links you need to find your way up the quasi-gradual slopes toward the castle above. The marked trail meanders along the surrounding hillsides making the climb fairly moderate. So as not to fatigue trekkers, you’ll find yourselves zigzagging, always upward. As you circle higher toward the castle, you will enjoy the ever-changing, absolutely beautiful distant views. Soon, among the manicured olive groves and earthy stone walls, you will arrive at the destination. Wow! What vistas of the expansive vineyards, villas and farms below! After enjoying the magical panoramas from atop the castle, the return route descends more steeply down the hillside toward the Arno and Albereta. We hope you enjoy the following photo gallery, and plan to visit Tuscany for a hike or two on the thousands of gorgeous trails—each one a picture-postcard photo at every turn.